The Hani is our print trim classic Macaroni full-zip hoodie with a contrasting print lined hood, made from our iconic fabric which is exclusive to Weird Fish. With a unique triple-twist, the Macaroni was named after the appearance of the twist in the yarn. 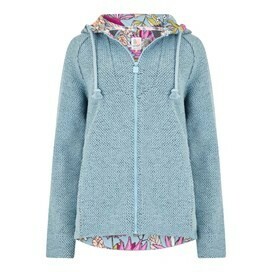 Wear the Hani print trim classic Macaroni hoodie this season and when temperatures drop, flip the hood up and shelter yourself from that stiff sea breeze. Love the colour, fits well and looks amazing. Love this hoodie! I am between 8 and 10, so size 8 fitted me very well. Looks nice with many other tops and trousers from Weird Fish, very comfortable to wear.